Eighth Doctor Paul McGann At The Year's Con Kasterborous | Warped Factor - Words in the Key of Geek. It is no secret that for more than fifty years now, the BBC television series Doctor Who has presented audiences around the world and of all ages with tales of the Doctor and his journeys through time and space. With its revival in 2005 and its subsequent success, the show's fandom as also seen something of a resurgence along with it. Alongside long standing conventions in the United States such as Gallifrey One and Chicago TARDIS, new conventions have begun popping up for those unable to get to those events. Since 2012, the city of Huntsville, Alabama has been home to an ever growing convention dedicated to the series. 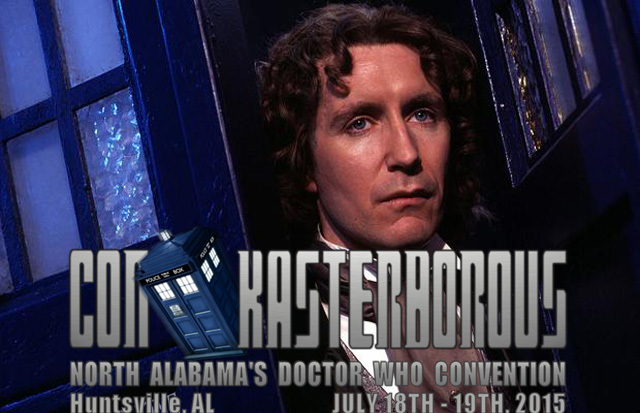 Named Con Kasterborous (after the constellation of which Gallifrey is/was a part of), the convention began as what seemed a low key event that, without a Doctor or companion as guests its first year, nevertheless managed to bring in around five hundred attendees, while 2013's convention, featuring Amelia Pond actress as a guest and saw the convention bring in a thousand attendees. 2014 saw Con Kasterborous move a couple of miles down the road to a larger venue at the Westin in the Bridge Street Town Centre, and along with Seventh Doctor Sylvester McCoy, script editor Andrew Cartmel & Torchwood's Gareth David-Lloyd it brought around 1600 attendees to the event. 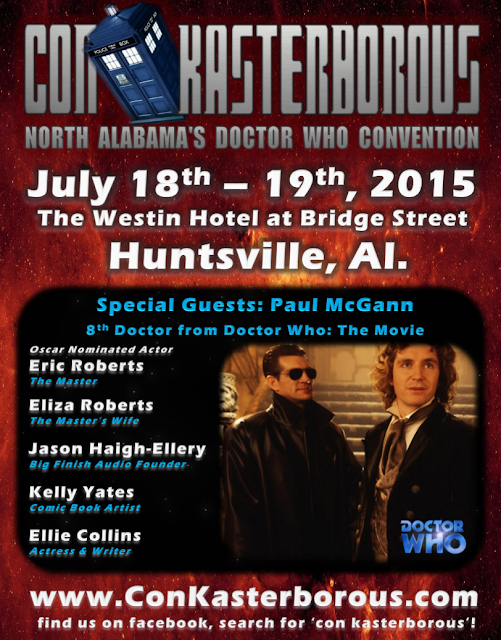 2015's event, taking place the 18th and 19th of this month, promises to be just as exciting with the convention welcoming three members of the cast from the 1996 Doctor Who TV movie. These include British actor Paul McGann who played the eighth Doctor, Oscar nominated actor Eric Roberts who played the Doctor's arch-enemy the Master and Eliza Roberts (who not only appeared in the TV Movie but is also Eric Roberts real-life spouse ). The other guests are Jason Haigh-Ellery (the founder and executive producer of Big Finish Production (which is the UK company that has produced hundreds of licensed Doctor Who audio dramas since 1999), the comic book artist Kelly Yates whose work includes IDW's acclaimed Doctor Who stories The Forgotten and Prisoners Of Time, and actress/writer Ellie Collins. In addition to the various guests the convention will have this year, fans can also look forward to a number of other events. There will be chances for them to have their photo taken with both the TARDIS and a full sized roaming Dalek, as well as to attend or even taking part in a number of panels discussing various aspects of Doctor Who from Big Finish to missing episodes, as well as other fandoms including the popular British series Sherlock. There will also be a spacious vendor's room where you can buy all things Doctor Who and sci-fi related. The convention will also include an artist alley where local craftspeople can showcase and sell their work. So, if you're a fan of Doctor Who, there's something for you to do.